If you’re a trainer, your job is to have the tools and knowledge to take your client’s performance to the highest level. Throughout that pursuit many underlying dysfunctions can surface. For example, if the deadlift hurts the left side of your low back, the problem probably isn’t the deadlift: the deadlift identified an underlying problem. To paraphrase Gray Cook’s famous line: don’t build performance on top of dysfunction. The training program a power athlete such as an MMA fighter or running back must follow is replete with explosive strength exercises that challenge full body stability. An essential component for progressively building an athlete’s performance while keeping him healthy hinges on a strong, stabile foundation of support from the core musculature. I’m not just talking here about building strong abs: your lats and glutes are just as important, if not more. And everyone knows that you’re only as strong as your weakest link. 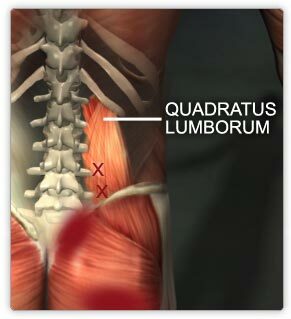 One muscle that I’m constantly seeing as problematic is the quadratus lumborum, or QL as it’s commonly referred to. Thanks to my work over the last few years with Dr. Craig Liebenson, owner of LA Sports and Spine, I’ve come to realize just how important this muscle is for power athletes, including anyone with back or knee pain. The importance of the QL becomes evident when you look at its anatomy and function. First, the medial fibers that attach to the spine also connect the ribcage to the pelvis. So these medial fibers play a crucial role in stabilizing your torso in the frontal plane. If you’re holding a heavy briefcase in your right hand, the left QL contracts to keep you from leaning to the right. In fact, research (Knapp 1978) suggests that paralysis of the QL makes walking impossible, even with braces. And when you throw or kick explosively, the QL must fire hard to maintain the correct torso position and provide the spinal stability to transfer power throughout your body. Second, the lateral fibers play an important role in lateral bending mobility. When you lean to the side, the lateral fibers must lengthen and then contract to pull you back up. Although, from a training standpoint, Dr. McGill demonstrates that it’s best to strengthen the QL with static exercises to preserve the intervertebral discs. Bending to the side, especially under load, is very stressful to the discs so that movement should be avoided. Another key point I learned from Dr. McGill’s research is that the QL needs endurance strength since its primary role is to provide lumbar stability. The QL, like many muscles in the body, can have far reaching, deleterious effects when it’s weak or spastic. Through Dr. Liebenson, I learned a series of compensatory actions that can occur when people have patellar tendonitis, that annoying dull pain directly below your knee cap. You see, the QL works with the contralateral glute medius muscle when you’re walkig. So if you’re walking with a heavy briefcase in your right hand, the left QL and right glute medius are firing hard to maintain correct posture and gait. However, when those muscles are weak excessive stress can be put on the right knee because the hips and core can’t stabilize the movement pattern. Put another way: when someone has right knee pain the right glute medius is usually weak. And since the right glute medius works with the left QL, there’s usually weakness or trigger points in the left QL. In other words, if you have right knee pain, strengthen your left QL and your right glute medius in order to take stress off the knee. Indeed, the QL is a vastly important muscle that must have plenty of endurance strength, and even more important, that endurance strength must be balanced as you test the QL on each side. If you can hold a right side plank for 70 seconds and a left side plank for only 4o seconds your left QL needs help. A strong, healthy QL is essential for everyone from fighters to those who have knee pain. That’s why I shot the following 12-minute video with Dr. Liebenson to teach you how to test and strengthen this often neglected muscle. If you missed my discussion with Dr. Liebenson on the role of the QL for performance, you can check out the YouTube video at this link. Strengthen the QL and you’ll become a stronger, healthier, more explosive athlete! This entry was posted in Ab Exercises for Men and Women, Gain Strength by Dr. Chad Waterbury. Bookmark the permalink. Question: not asking for a diagnosis here. This will bear on your knowledge as to how muscles work together. When doing unilateral leg exercises, right leg, I’ve noticed that my lumbar spine rotates left and my right hip appears to jut out. Interestingly, my massage therapist says I have an overactive RIGHT QL. Could the spastic QL be pulling the pelvis up and forcing the deviation ? Also, sure enough, I have anterior left knee pain, and it is my RIGHT glute medius which tends to fatigue more quickly when doing side-lying clam raises. I was really going to town on the left glute medius thinking that was the problem! In any case, I’m going to give these progressions a try as stretching the right QL only yields short-term results. CW: First, don’t confuse “overactive” with “strong.” It’s probably overactive because it’s too weak. Also, you need to strengthen your glute medius to keep your hip from jutting out to the side. Hey chad, When I am doing any single leg work for my posterior chain like single leg rdls or back extensions I always feel my left ql spasm when working my left leg. Any idea why this might be? My right side is weaker than my left could this be the cause? CW: Yes, it’s weak. Use this video to strengthen your QL on both sides. I have a depressed right side of my body. My shoulder slumps and and I am forever tight in the right QL, and the tight shoulder muscles. From rhomboids, to lats.